The U.S.-backed Afghan government of Hamid Karzai is stamping out local government, which only inflames the country's insurgency. Although the war in Afghanistan—with its tally of U.S. combat deaths now exceeding 2,000—has largely faded from the news, it is useful to consider why the conflict is so intractable. Why has a campaign that initially seemed so hopeful resulted in a country that is politically fractured and increasingly deadly for Afghans and foreign militaries alike? One clue can be found in the country’s governance. The initial promise of inclusive and accountable Afghan government, embodied in the constitution approved by the 2003 Loya Jirga, has been squandered. The Afghan constitution provides for a more highly centralized government than is historically congenial to Afghanistan, but this centralization is balanced by the constitutional requirement for the direct election of mayors and of district, city, and village councils—a return to the pre-Soviet practice of locally elected offices and locally managed affairs. The Karzai government, however, has chosen not to implement any of these provisions, and the international community has acquiesced. Instead, President Karzai appoints all mayors, and the only district and city councils are those organized and funded by the international community. The (non-existent) district councils are supposed to appoint members of the Meshrano Jirga, the upper house of Parliament, providing district input at the national level. Provincial councils are indeed elected per the constitution and appoint a member to the Meshrano Jirga, but under a decree signed by President Karzai in 2005, their powers are mostly advisory. In 2005, I heard an Afghan-American professor speaking in Kabul postulate that this lack of local accountability was the root problem in Afghanistan and the main driver of the insurgency—which was then barely noticeable to the rest of us. As he put it, under this system, “Afghans aren’t citizens; they are subjects.” All the Afghans in the room cheered. Nearly eight years on, we are reaping the fruits of that lack of accountability. Afghanistan has a number of large cities—Kandahar, Jalalabad, Herat, Mazar-e-Sharif, and of course Kabul—that should be engines of economic growth and participatory politics. Instead, mayors are appointed to advance the president’s interests rather than to address local needs. While municipalities must support themselves by raising their own taxes, their budgets, hiring decisions, and salaries are all set in Kabul. Americans would never stand for such lack of control over local affairs, so why should we expect the Afghans to tolerate it? U.S. support of the Karzai government is only facilitating the top-down control that in turn helps to drive the insurgency, and the United States is seen to be supporting the Kabul government against the interests of the average Afghan. In the absence of structural accountability, U.S.-led anti-corruption efforts—which consist mostly of urging the Karzai administration to prosecute wrongdoers—are no challenge to the regime. Worldwide, the single most effective anti-corruption tool is electoral accountability. In the United States, we can “throw the bums out.” Afghans have no such option. The continued lack of Afghan governmental accountability will continue to constrain economic activity, alienate citizens, and fuel the insurgency. It is likely to lead to more U.S. and NATO deaths before the withdrawal, and more instability afterwards. An insurgency driven by lack of accountability cannot be eliminated by military force. Only altering the institutions of government can change the dynamic. Decentralization of power would go a long ways towards improving life at the local level and eliminating the need for insurgency as a mechanism for political opposition. Given the current constitution, local officials could be elected, and real power devolved by statute. While the consequences of lack of accountability are primarily manifest at the provincial and local levels, the accountability problem can only be addressed by Afghan national policy. The Karzai government has demonstrated that it has no interest in local accountability. It is time for the international community to insist that Afghanistan fully implement its own constitution as a quid pro quo for further support. 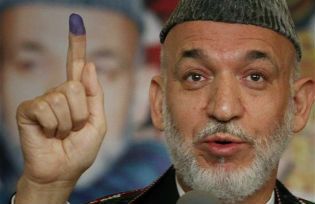 Between now and 2014, there is time to reduce that part of the insurgency that is anti-Karzai (and, by association, anti-American) rather than pro-Taliban, and leave a legacy of permanent sustainable institutions of sub-national government. In the run-up to the 2014 presidential election, local elections could also serve to broaden the political space and allow potential candidates to demonstrate their ability to govern. Expanding elected government would help Afghanistan’s putative democracy mature beyond its current centralized, “winner take all” dynamic, and create multiple bodies of authority to help draw more citizens into the political process. This is a legacy that we can leave for Afghanistan. Local accountability is the closest thing to a silver bullet that we are likely to find in Afghanistan. We should use it. Inge Fryklund, JD, PhD, has spent more than four years in Afghanistan working with the legal system and with national, provincial, and municipal governments. She is recently returned from Helmand Province.